Still not quite ready to get these going on a daily basis (though the last one was yesterday, so we may be getting there...), but here's the next installment of Scary-Crayon's Creepy Freaks Halloween Countdown! Spotlighted today: Headley and Spitty Cat. Headley is one of those obscure characters who simultaneously manages to be bland and interesting. With his homemade superhero costume and lame slingshot weapon, he's not the most stylish kid on the block. Yet the fact that he's also able to remove his own head and launch it at the enemy -- complete with leaking brains and eyeballs from the slit in his skull -- helps to distinguish him from other more or less forgettable characters quite a bit. Where did Headley come from? How did he gain his incredible powers? What motivates him to fight for the good of his fellow man monster? Do his brains grow back after each attack? Inquiring minds want to know. Something about Headley just screams of heroism, so he's not really creepy or freaky in my book -- the brain thing is kinda gross, but otherwise he seems incredibly out of place among the Creepy Freaks. 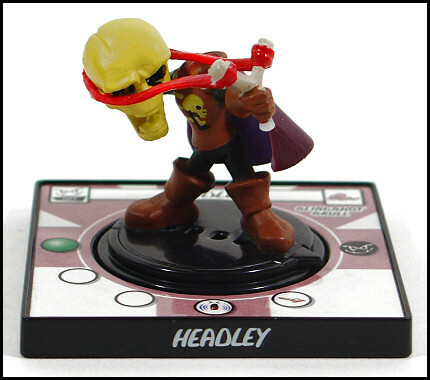 Rather, I think Headley would be more at home in some corner of the Marvel or DC universe. He'd never be a major player like Dr. Strange or the Martian Manhunter, but he'd fit in well beside the mostly forgotten but (sometimes not-so-) fondly remembered (if only by a few) characters like the Night Nurse and Brother Power. Excelsior? 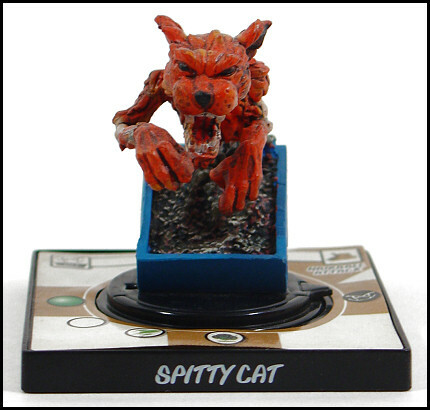 Spitty Cat is probably the creepiest and freakiest character we've seen thus far. Yes, he's an undead, decomposing cat emerging from a box of kitty litter -- which is admittedly more disgusting and horrific than it is creepy or freaky -- but keep in mind that Spitty Cat's not (necessarily) a bad guy. In fact, he was likely a beloved pet until, owing to the forgetfulness of the neighbor who was supposed to feed him while his owners were on vacation, he collapsed in the litter box, died of starvation, and began to rot away. But Spitty Cat knew that little Timmy would be devastated to find his kitty dead, so by sheer force of will he survived his death and partial decomposition just so he could rub up against Timmy's leg and purr upon the child's return from Disneyland. Of course, the general grossness of living dead things prompted the family to get rid of poor Spitty, which eventually led to his arrival in the Creepy Freaks world and naturally soured his once playful disposition. Nevertheless, the tragic elements of his tale and the love still residing in his worm-eaten heart keep him out of the realm of horror and ensconced in the less severe categories of creepy and freaky.